Baby Sleep Problem: My Baby Won't Nap at Daycare! Baby Sleep Problem: My Baby Won’t Nap at Daycare! Share with them all you have accomplished with her night sleep and how she naps well on the weekends according to this schedule (hopefully that is true). Talk to them about meshing their nap schedule with your child’s sleep windows. Share your knowledge of sleep science and the importance of good, restorative naps! 7:00 to 7:30 a.m. Wake-up. Upon waking, nurse or bottlefeed and give solids. 9:00 or 9:30 a.m. Morning nap, one and a half to two hours. Upon waking, nurse or bottlefeed and give solids. 12:30 or 1:00 p.m. Afternoon nap, one and a half to two hours. Upon waking, nurse or bottlefeed. 3:30–4:00 p.m. (depending on previous naptime). Optional third nap, about forty-five minutes to an hour. 5:00 or 5:30 p.m. Nurse or bottlefeed and give solids. 6:00–6:30 p.m. Start bath and bedtime preparations, which may include an additional bottle or nursing. In other words, have her at least make sure that your child meets the age-appropriate amount of daytime sleep no matter what it takes. If, for example, she generally rocks your baby to sleep, then have her continue to do this when putting your baby down for naps. Tell her to rock her back to sleep if she wakes before 45 minutes so that she’s not having disaster naps all day long. As long as you don’t rock her to sleep during the day or night, this can work. If your caregiver is putting your baby down awake for the nap but then she wakes after 30minutes, ask them if they can go to her and reassure her back to sleep. If you are putting her down asleep for naps then work on putting her down awake and nap coach as outlined in “The Sleep Lady’s Good Night, Sleep Tight”. When you’re fairly confident that your child has learned to get herself to sleep, talk to your caregiver again. Explain what your baby has accomplished, and ask her to work with you by putting your baby down awake for naps within the appropriate nap windows and reassuring her when she wakes from too short of a nap. Maybe they can just rock or hold her for a shorter period of time and then pat and “sh-sh” her to sleep, instead of rocking her until she’s totally out. • Perhaps your provider would be willing to put her down in the sleep area a few minutes before she brings in the rest of the babies. 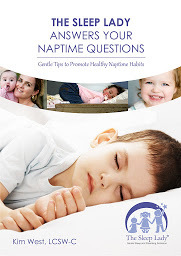 • Bring in a sound screen or white noise maker and ask if they can use that over by the cribs where the babies are sleeping. • When you pick up your daughter always ask for a nap report- what time did she sleep and for how long. If the sleep tank is low then let your baby take a snooze in the car ride home to help her make it to bedtime not too overtired. I have had a few cases where the parents changed daycare providers because it was not a good match for their baby’s temperament and sleep needs or the daycare center was not willing to make sleep a priority but that’s a worst case scenario! Schedules work. They are tough, but they work. I just pulled my 13 month old from a daycare where she loved it but couldn’t sleep. It was perfect but she had a pack n play in the same room with olde children running around and it was beside a tv. There was also a 10 month old in another pack and play. It broke my heart because my baby loved her caregiver and other kids. Great care, socialization but no real sleep. I couldn’t get he caregiver to move her to a room so I decided she was too young to be so sleep deprived. It was throwing off her whole week and she was in 2 days. I question my decision but felt sleep was more important that high stimulation at her age.